The pursuit of smooth, well-groomed nails is a never-ending goal for many. Unfortunately, manicures are only as good as the nails underneath them; ridges in nails look even more pronounced if any polish is applied. Most nail ridges are more of a nuisance than a signal of a health problem, and are often a genetically-inherited trait. Use the right tools and technique to eliminate them without damaging your actual nails. 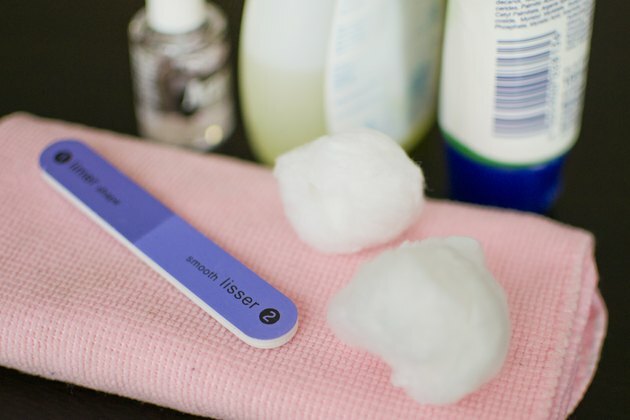 Remove any existing nail polish using a cotton ball saturated in nail polish remover. You must buff the actual nail to remove ridges, which you can't do if they are polished. Wash your hands thoroughly with soap and water to remove any dirt, or nail polish remover if applicable. Dry your hands on a clean towel. Apply a tiny pin drop of cuticle cream or a nail oil, such as almond, directly to the tip of each finger nail. Massage the oil or cream over the entire nail bed to moisturize it and prevent cracking and peeling. This will also help soothe any dry skin or hangnails. Pick up a fine-grit cushion nail file in one hand and hold it over the top of one of your nails. Gently buff the nail from the corners toward the center using an “x” pattern. Lift up the nail file completely after each stroke, and apply no more than four to six strokes so that you don’t file through the nail. Repeat the process to buff each remaining nail. Repeat the buffing process once per week until the ridges are no longer visible. If applying polish, apply a ridge filler product first. Light, vertical ridges in the nails are typically inherited or due to aging. If your nail ridges are genetic they will return if you stop the buffing process. Make an appointment with a physician if the ridges in your nails deepen or darken significantly, as this can indicate a serious medical issue such as thyroid or kidney disease. Do not attempt to buff your nails completely smooth at one session. This can damage your nails and may even file through to the nail bed underneath it.